Perfume Shrine: Georgia the Biggest Consumer of Celebrity Fragrances? Georgia the Biggest Consumer of Celebrity Fragrances? are popular with both affluent and lower-incomed customers! It's also noted that they're most popular among young people, though not exclusively. Avril Lavigne, Naomi Campbell, Christina Aguilera and Antonio Banderas are named some of the most favourite celebrity brands for Georgians according to Khatia Shamugia, PR Manager of Ici Paris. These are often bought by mothers for their daughters (so mothers, beware what you introduce your impressionable offspring to!) or for their best friends. “I am kind of a celebrity perfume lover,” said Nanu Abashidze, 19. “Of course I prefer to buy high class brands such as Chanel and Yves Saint Laurent but they are much more expensive. So I prefer to buy cheaper brands, and I am quite content with their smell. Avril Lavigne is one of my favourite celebrity cosmetic brands. I started using it recently and can’t give it up,” Abashidze said. "it's worth wondering if the quality of high-end brands has gone down so downhill that there isn't really much to differentiate them from celebrity fragrances or lower-end products than their perceived prestige..." You are so right! Besides, designer, high-end fragrances are actually "celebrity" fragrances, since they use the name of the House. Perfumery is done par excellence by traditional / full-schedule perfumery houses. Although, it's been some years that only perfumery houses offer products that I enjoy wearing, I find it fun to buy a celebrity fragrance :) Actually, I'm intrigued by Dita von Tease's "Femme Totale" new launch, and will buy it, just because it' s cheap (I can make of it a room spray, without hesitation, if I don't enjoy it). Celebrity perfumes get tiring after a while. So many of them smell cheap, or sour on my skin. The ones that I have smelled, well, smelled like a generic fruity floral(I think I have turned into a perfume snob). Maybe celebrities are pushing them out too fast without thinking. Quality over quantitiy is pushed to the side to make a quick dollar. When a designer puts his brand on the front, aren't we supposed to covet having some of his glamour grafted onto us? I suppose they're prey to focus groups all claiming a fruity floral as the surest road to blahness, the ethos of contemporary fragrance for the masses. Like your article! What an absolutely beautiful transformation, it's too true. 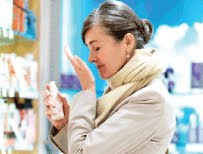 Hi E -- Very good point about the downgrading of formerly fine fragrances ... hmmm..."formerly fine fragrance" has such a nice ring, don't you think? Georgia in the U. S. and Georgia in the Caucasus are somewhat different places and I admit I'm not sure which one is discussed. Your comment was very interesting and I agree with Asuka too. I also would like to smell Dita Von Tease, but I am in the US. I am not at all into celeb scents but I will admit, and come out and say...(and don't take away my Perfumista card!) ...I really like Kate Walsh's Boyfriend. I actually bought a bottle and get so many complements from older woman my age on it and I about have to apologize for the stupid name. I mean I am married with kids, haha! you have an eye for alliteration! Indeed it makes a great acronym too. I'm not in the US either and therefore perhaps more appreciative of Dita's project. I wonder if there will be a stateside launch as well (UK?) Will report back if I sample in the end. Actually, the article is about the country Georgia in the Caucasus. Tbilisi the town mention in the post is the capital of Georgia. Also, the original article mentions prices in GEL, or Georgian Lari, their natioanl currency. That goes to show you I shouldn't make assumptions. Thanks! Also: colour me unimpressed by both the infiltration of celeb frags into Caucasus and their populatiry.